The Prime Minister’s decision to make a standalone visit to Russia at this stage is a reflection of the country’s importance in the bilateral, regional and global context. Prime Minister Modi’s visit to Sochi, for an informal summit on 21 May with Russian President Vladimir Putin follows a similar engagement with Chinese President Xi in Wuhan on 27-28 April. Both engagements have been described as aimed at exchanging views on issues with a broad and long-term perspective. Like his visit to France in June 2017 after the inauguration of President Emmanuel Macron, and Germany in April 2018 at the start of Chancellor Angela Merkel’s new term, Modi is visiting Russia soon after Putin’s swearing-in for his fourth term on 7 May. Modi and Putin are expected to meet several times this year: During a bilateral visit by Putin to India, and on the margins of multilateral events such as the SCO, BRICS and G-20 summits. dependence on China, its exploration of new opportunities with and sensitivities towards Pakistan, outreach to the Taliban, and the uncertainties caused by the Trump administration’s unpredictable and unilateralist impulses. Moscow’s overtures to Islamabad have been watched with some anxiety. It continued with a scheduled military exercise with Pakistan in 2016, a week after the terrorist attack in Uri. It has supplied four Mi-35 helicopters to the country, contrary to its earlier practice and commitment to not provide Pakistan with military equipment. It has reached out to the Taliban, scheduled meetings with China and Pakistan on Afghanistan, and suggested that too much pressure should not be put on Pakistan in the Afghanistan context. It has been suggested that Russia is looking at widening its options even as India has exploited multi-polarity by deepening relations with the US, the UK, Germany, France and Japan. Its worsened relations with the US and Europe have forced Russia to strengthen economic and political cooperation with China, despite concerns about potential Chinese dominance in the Russian far east. Putin was among the prominent attendees at the Chinese Belt and Road Forum in May last year. It has supplied military equipment, and the two coordinate closely at the UN. In an interview in March this year, a prominent Russian analyst, Sergei Karaganov, described China and Russia as “quasi allies”, saying Russia would not want to choose between India and China. Another major challenge to the India-Russia relationship arises from the difficulties in Moscow’s equation with the US and Europe. Russia is under strong US sanctions that target individuals and entities, including in the defence sector. India’s major future purchases, such as the S-400 air defence system, could be sanctionable under US law. So far, the law does not provide for waivers on national security or other grounds, although the administration has been making a case with the US Congress for such a provision. Given India’s historical defence relationship with Russia, the continuing dependence for up to 60 per cent of our equipment, and the legacy of political cooperation, the bilateral relationship cannot be allowed to be constrained by the policy options of a third country. Another potential problem for India is on account of the US’ withdrawal from the Iran deal. From 6 August, US dollars cannot be used in Iran-related transactions. From 4 November, countries would need to show about 20 per cent reduction every six months in oil imports from Iran, or importing entities and facilitating banks could come under US sanctions. Everyone is waiting to see the positions European governments take. So far, in public comments, they have remained defiant, and spoken of protecting their sovereign decision-making, of blocking provisions to protect their own entities. However, concerned companies have already signaled that they will start reducing their involvement in Iran since, for many of them, the economic relationship with the US is far more critical. Insurance on Iranian shipping may become unavailable, as in the days before the Iran deal, as could Iran’s access to SWIFT banking transactions. India will need to focus on preserving its involvement in Chabahar on account of its importance for access to Afghanistan. The present US policy of ‘America First, Trump first, domestic policy first’ is upending the international order. US allies in Europe will look at enhancing space for their own decision-making. Canada and Mexico are smarting under US trade pressure. Japan is holding trilateral meetings with China and South Korea. 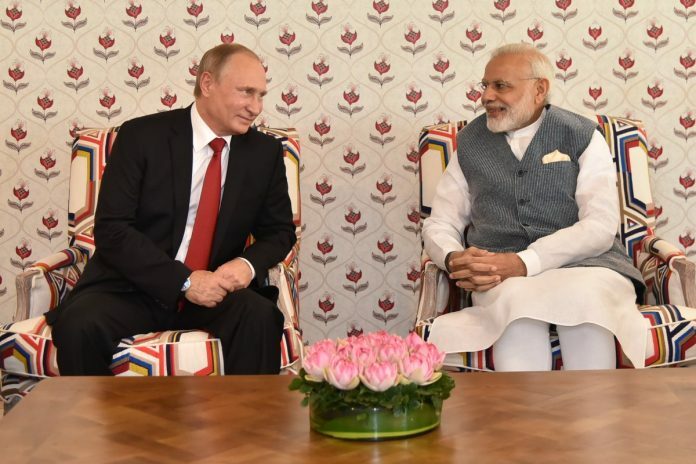 There is much for Putin and Modi to talk about from a “broad and long-term perspective”. Arun K. Singh is former Indian ambassador to the US.